Exciting news — digital poet and artist Dan Waber will be visiting Temple as part of my fall Special Topics course on Electronic Literature. I’ve been working with Laura Zaylea in Temple’s Media Studies and Production Department to bring him to campus, and we’re both very excited to have him. 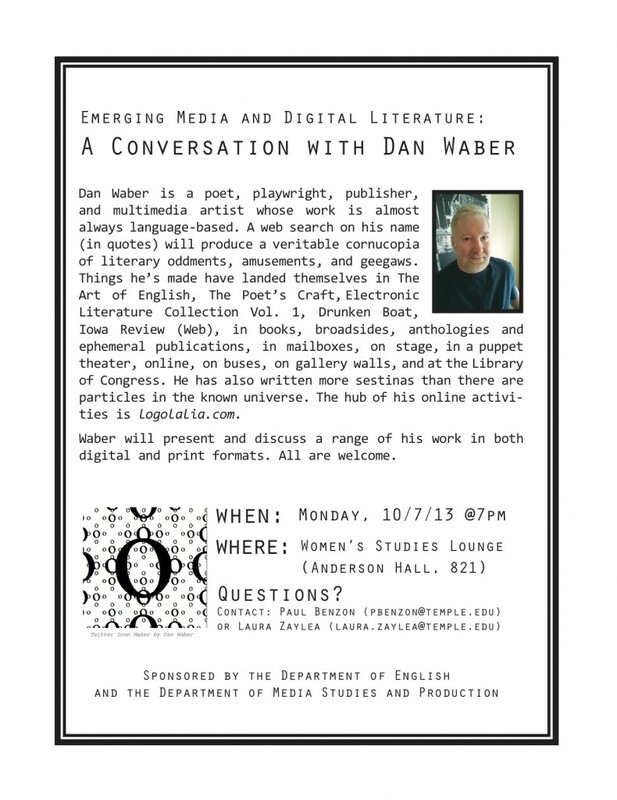 Waber will be reading from and discussing a wide range of his work, and we hope it will be a rich conversation on authorship, artistry, language, image, new media, publishing, process, and Processing (and he’s promised to bring plenty of his many sestinas to share!). Details are below, and the event is open to all — please circulate widely and come join us!